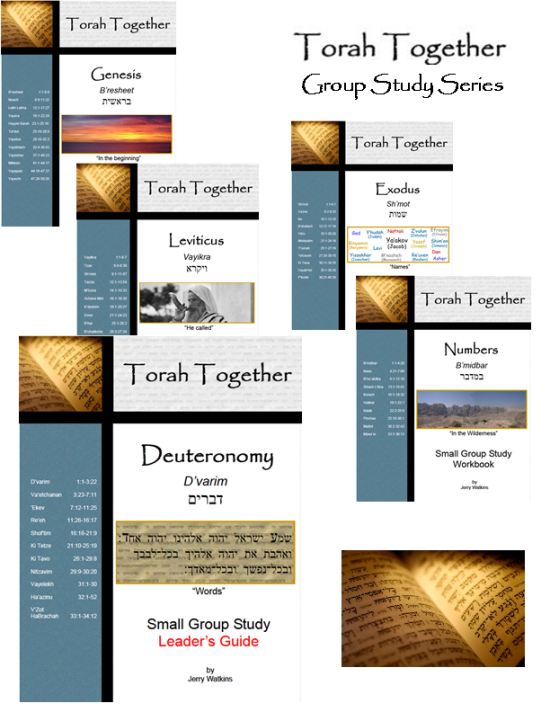 Thank you for your interest in the Torah Together study series. Both the Workbooks and the Leader's Guides are available for each of the five books of the Torah in print as shown below. Each book is printed on high quality 8.5" x 11" paper and bound in loose leaf fashion so that it lays open flat on your table or desk. This encourages the student to study the material before class thus greatly enhancing the learning experience. For each book you wish to order, enter the quantity desired and click the "Add" button. When you've finished entering your order, click the "checkout" button at the bottom of the form and you will be transfered to PayPal's secure website to complete the transaction. Each book is $15.00. Shipping is via US Postal Service Media Mail and the cost is based on the number of books ordered. For example, shipping for up to 5 books is $5.00. For large quantity orders or for foreign shipping, please email me at jerry@torahtogether.com for a special quote. While this endeavor is definitely a "labor of love" for me, I greatly appreciate help in covering my expenses. If you feel led to do so, please make a donation to the Torah Together project by clicking on the button below. Also, if you have any stories of how these materials ministered to you or to others, please drop me an e-mail and let me know about it. Thanks again for your support and may God bless you as you study His teaching and instruction, the Torah.